Tata Power Solar, India’s largest integrated solar player and Manipal Institute of Technology, India’s leading technology institute, which is a constituent of Manipal University, unveiled today - SERVe (Solar Electric Road Vehicle), the university’s first prototype solar car ready for exploring commercial viability. Designed by students of SolarMobil team, with an intention of commercial usage, the vehicle is custom-fit with bespoke solar panels designed by Tata Power Solar. SERVe is the perfect showcase of an industry-academia effort that will help increase the role of solar innovation in green mobility, with an objective of proliferation of eco-vehicles. Designed keeping in mind the mobility and commercial viability, the solar panels have been custom-made to fit the car’s curved surface enhancing the aerodynamics and performance of the vehicle. The highly efficient customized panels weigh just 35kgs and provide upto 960 watts power and weigh less than half of the conventional panels. The car also houses a Direct Solar Drive, powered by solar panels, to maintain the cruising speed and is supplemented by extra power from its high-end energy storage system. “We are pleased to be part this project driven by a talented student-team. This project epitomizes Tata Power Solar’s belief that fostering innovation is key for the proliferation of solar energy. We not only encourage innovation within our organization but also propagate universities participation for this cause, since they can play an important role in driving innovation in partnership with the industry. The solar car is one of many ventures which we have supported, and we firmly believe India’s students will act as a key contributor in the progress of our solar industry.” said Ashish Khanna, ED & CEO, Tata Power Solar. The core members of the student design team SolarMobil, include: Anudeep Reddy, Jeet Bannerjee, Siva Bhushan Reddy, Anjan Kumar, Varun Gupta, Rohan Sahdev, Madhav Lakhotia, Samay Goenka, Sulekh.P, Akshat Singh, Amol Grover and Nikhil Gumidelli. Manipal University is synonymous with excellence in higher education. Over 28,000 students from 57 different nations live, learn and play in the sprawling University town, nestled on a plateau in Karnataka’s Udupi district. It also has nearly 2500 faculty and almost 10000 other support and service staff, who cater to the various professional institutions in Health Sciences, Engineering, Management, Communication and Humanities. Every institute has world class facilities and pedagogy, which are constantly reviewed and upgraded to reflect the latest trends and developments in higher education. Some of its premier institutes are the Kasturba Medical College, and the Manipal Institute of Technology. 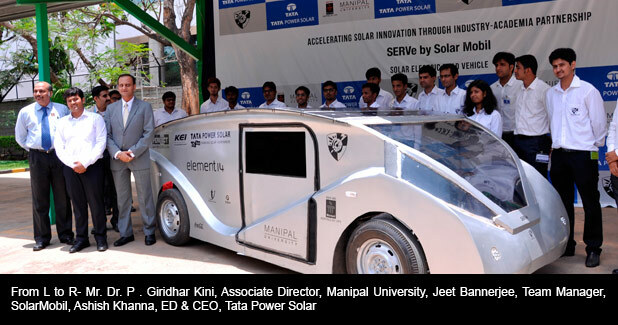 SolarMobil Manipal is a team of students from various branches of Manipal Institute of Technology. The team’s aim is to successfully design, test and build a vehicle powered solely by solar energy, and to showcase it's car across world. The team plans to approach every project with drive, innovation and efficiency as the cornerstones, around which it hopes to build a wealth of experience & knowledge. The formation of SolarMobil.manipal was initiated in August 2011 and since then, the team has involved themselves in research in the field of "new age" solar arrays, high output "Eco-friendly" batteries and the latest super-efficiency motors. The team consists of students from different fields of technicality – Mechanical, Electrical, Instrumentation, Aeronautical, Automobile and Mechatronics all combining their skills, knowledge and experience to make a car we can truly be proud of. Tata Power Solar (TPS), with 25 years of deep domain expertise, is one of the pioneering solar manufacturers in the world and India’s largest specialized EPC player. Founded in 1989, the company was originally formed as a joint venture between Tata Power and British Petroleum Solar (BP Solar). As a pioneer and market leader in the solar space, headquartered in Bangalore, TPS now operates independently as a wholly owned subsidiary of Tata Power. TPS has a strong national presence with 8 regional offices, 40 authorized service centres plus a network of more than 1000 channel partners nationwide.